Look fear in the face! These words by Anna Eleanor Roosevelt (October 11, 1884 – November 7, 1962) really sum up her life experience of fear. She had a difficult childhood and despite the trappings of wealth, Eleanor had an unhappy childhood. Her father turned to alcohol for comfort at the death of his own mother and was away from home for long periods of time. Her mother also battled as she was disillusioned by her husband. Little Eleanor couldn’t help but become very aware of the the tension between her parents and at the young age of six took on mothering responsibilities towards her mother. This is so typical of a child brought up in a home with alcohol abuse. Eleanor’s mother, who was one of New York’s beauties at the time, intimidated her daughter making her very self-conscious. She even nicknamed her daughter ‘Granny’ because of her ‘very plain, old fashioned’ looks. As a result, Eleanor was a serious child. At the tender age of 8 her mother died and Eleanor focused on getting attention from her father who she felt loved him. However, he died of alcoholism and depression some 19 months later. At the age of 10 Eleanor became an orphan and was cared for by her grandmother. Life improved for Eleanor when she attended Allenswood Academy in London in 1899. These were very happy years during which time she became socially and politically aware. She gained confidence and became more independent during this time. Much to her families horror she became involved in reform movements. 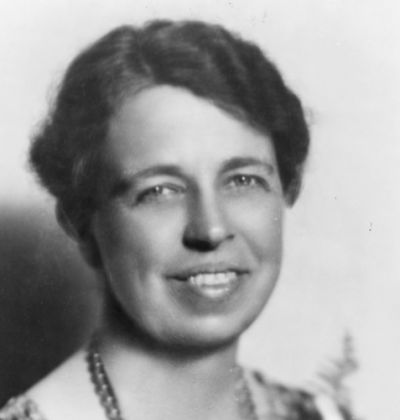 A chance encounter on a train led to a romantic involvement with her cousin Franklin D Roosevelt. Franklin’s mother disapproved of the relationship but after a 16 month engagement, they were married in 1905. To put it mildly, her mother-in-law was very interfering, and made many of the family decisions for Eleanor. Once Franklin Roosevelt’s political career developed, Eleanor was able to live a life released from the shackles of her mother-in-law. However, the marriage was not happy as her husband was continuously unfaithful. In the end the marriage was one of political convenience rather than a marriage based on love. Closing words: Being rich doesn’t protect one from hardship. Hardships can be used for good, allowing us to gain courage and confidence. Keep moving forward and if there is something that you think you cannot do, face it and do it. If the idea came into your head in the first place, you can use the fear as a challenge from which to grow! Previous Previous post: Alarms ringing! Next Next post: Learning while Anxious!